1. In 2008 and 2009, unknown to shareholders and the public but known to Wells Fargo CEO John Stumpf among others, Wells Fargo borrowed from the U.S. Federal Reserve Bank's (FED) Term Auction Facility (TAF), representing massive, material undisclosed loans and a credit line with the FED, details of which were not disclosed within Wells Fargo's 2008 and 2009 Securities and Exchange Commission (SEC) filings and Wachovia merger related litigation pleadings. Search for "Term Auction" results for 2008 = Zero. 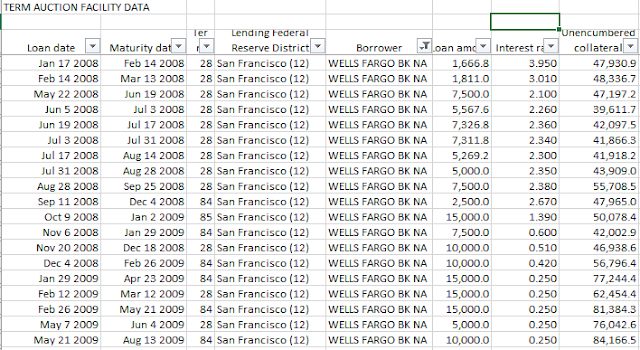 Search for "Discount Window", which Wachovia borrowed from before merging with Wells Fargo on October 6, 2008 results = Zero. 4. Wells Fargo's 2008 annual report certified by John Stumpf, didn’t disclose the overall size of FED’s TAF credit lines, terms, interest charges, dates, collateral, values or amounts of U.S. Government provided financial assistance in violation of SEC and Sarbanes Oxley (SARBOX) reporting laws. 5. In an interview on Tuesday, June 10, 2008, after Wells Fargo borrowed billions from the FED’s TAF, representing 15.27% of the company's market capitalization, John Stumpf stated "I have a general aversion to using public money, our citizen's money, to bail out problems for a particular sector" and "...in our company's case, to be able to not only pay for the credit hits we took, we actually added to our reserves" and "We added organically to capital", which wasn’t’ true. 6. In March, 2009, Senator Bernie Sanders website reported "During the worst financial crisis in our nation's history since the Great Depression - a crisis which has led to the largest taxpayer bailout ever - the very least we can do is explain to the American people what the Federal Reserve is doing with their hard-earned taxpayer dollars," Sanders said. At a Senate Budget Committee hearing on March 3 , Sanders asked Fed Chairman Ben Bernanke to name the hundreds of banks that took money since the financial crisis began. Bernanke refused to name any of the financial institutions and would not say what the banks are doing with the money. Sanders noted that a separate $700 billion financial rescue package that was signed into law last October requires the Treasury Department to identify recipients of bailout funds. 8. If the SEC became aware through the news that Wells Fargo borrowed billions from the FED, Wells Fargo didn't report material information to the SEC in filings certified by John Stumpf. 9. Wells Fargo’s response stated "We did participate in the Term Auction Facility (TAF) during 2008 through August 2009." And "At December 31, 2008, our short-term borrowings under TAF totaled $72.5 billion, which included $40 billion of TAF borrowings by Wachovia Corporation at the time of acquisition. However, the TAF borrowings were classified differently in the legacy Wells Fargo and Wachovia accounting systems..., which resulted in our reporting of $32.5 billion of the TAF borrowings in the “Commercial paper and other short-term borrowings” line item, and the $40 billion of Wachovia TAF borrowings reported in the “Federal funds purchased and securities sold under agreements to repurchase” line item of Note 13 (Short-Term Borrowings) in our 2008 Form 10-K. Despite the accounting systems difference, our management did not distinguish TAF from other sources of short-term borrowings [GH; meaning both company’s accounting was combined for the fourth quarter of 2008, as there was no Wachovia 2008 annual report]" and “nor did we access the Federal Reserve’s discount window for liquidity purposes during 2008 and 2009”, yet Wachovia did. 10. After borrowing $1.6 billion from TAF on January 17, 2008 with a $47.9 billion FED credit line, John Stumpf exorcised 68,980 shares of Wells Fargo stock worth $2,077,815. On May 5, 2008, Stumpf bought 1,550 shares of Wells Fargo worth 44,841 and was not charged for Insider Trading and Securities Fraud. On June 6, 2008, while Wells Fargo was in possession of undisclosed FED TAF loans, former Wells Chairman Richard M. Kovacevich purchased 40,398 of Wells Fargo stock valued at $1,052,367 and was not charged for Insider Trading and Securities Fraud. 11. During 2008, Wells Fargo stock option related insider transactions also involved Atkins Howard I (Senior Executive VP & CFO), Milligan Cynthia (Director), White Julie M (Executive Vice President), Runstad Judith M (Director), Swenson Susan (Director), Quigley Philip (Director), Oman Mark C (Sr. Executive Vice President), Tolstedt Carrie L (Sr. Executive Vice President) and Loughlin Michael J (Executive Vice President). See above link. 12. Before arriving on July 9, 2008 as CEO of Wachovia, Robert Steel was in a ‘need to know position’ of massive undisclosed material FED borrowing as Under Secretary for Domestic Finance of the United States Treasury under former Goldman Sachs colleague Hank Paulson. 13. On March 31, 2011, Bloomberg reported “During the financial crisis and prior to the Wells Fargo merger while still an independent company [GH; but after the merger with Wells Fargo was announced on October 3, 2008], Wachovia borrowed and repaid funds from the discount window,” Mary Eshet, spokeswoman for San Francisco-based Wells Fargo, said..." unmentioned in Controller Richard D. Levy's December 21, 2011 response to an inquiry by the SEC's Stephanie L. Hunsaker without consequence in item 9. On April 4, 2011, Bloomberg reported "Wachovia Corp. was the only U.S. bank among the top five discount-window borrowers as the crisis peaked. The company, based in Charlotte, North Carolina, borrowed $29 billion from the discount window on Oct. 6, in the week after it almost collapsed, the data show. 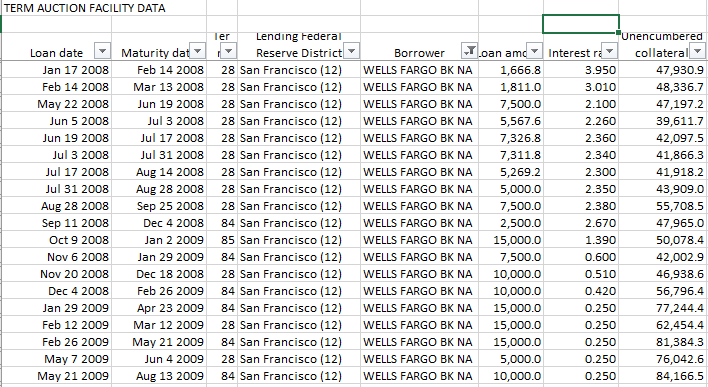 …The Wells Fargo deal closed at the end of 2008. Wells Fargo spokeswoman Mary Eshet declined to comment on Wachovia’s discount-window borrowing" after commenting on Wachovia’s discount window borrowing on March 31, 2011. 14. On October 31, 2008, WELLS FARGO & COMPANY FORM S-4 REGISTRATION STATEMENT UNDER THE SECURITIES ACT OF 1933, which prominently listed James M. Strother, Esq., Executive Vice President and General Counsel of Wells Fargo, stated; "Liquidity continued to decline and by the end of September 26, Wachovia’s management was concerned that, without accessing the Federal Reserve’s discount borrowing window, Wachovia’s banking subsidiaries would not be able to fund normal banking activities on Monday, September 29. Wachovia had been regularly reviewing its liquidity situation with the Federal Reserve and the OCC, who on that day remained on site." after Wachovia borrowed $12.5 billion from the FED’s Term Auction Facility and $29 billion from the FED’s discount window on October 6, 2008, violating security reporting laws on October 31, 2008, by not disclosing the type, terms, interest charges, dates, collateral, values or amounts of federal financial assistance provided by the FED, in violation of SEC and Sarbanes Oxley reporting laws. The FED’s Discount Window data for 2008 is missing from their website. 16. On March 27, 2008, Wachovia borrowed an undisclosed $3.5 billion from the Federal Reserve’s Term Auction Facility with $65.8 billion in Unencumbered Assets, which showed Wachovia had a massive unreported Federal Reserve material liquid credit line bigger than Wells Fargo’s. 17. On 6/30/2008, Wachovia's outstanding Federal Reserve provided Term Auction Facility borrowings totaled $10 billion, representing a material 29.82% of the company's market capitalization. 18. Wachovia Corporation's June 30, 2008 form 10-Q certified by Robert Steel did not disclose the type, terms, interest charges, dates, collateral, values or amounts of federal financial assistance provided by the FED’s TAF. 19. On July 22, 2008, Mr. Steel personally purchased 1,000,000 shares of Wachovia’s stock, among others and without consequence, as Wachovia’ undisclosed Federal Reserve Term Auction Facility (TAF) borrowing reached $12.5 billion, representing a material 34.85% of the company's market capitalization. 20. In an interview with CNBC's Jim Cramer On Monday, September 15, 2008, Robert Steel said "I think it's really about...transparency. People have to understand the assets and really be able to say, this is what I own" and "Complete disclosure" and "we can work through this with transparency, liquidity and capital" and "Our strategy was to give you all the data" and "we're raising capital ourselves by basically shrinking the balance sheet, cutting the dividend, cutting expenses. We can create more capital ourselves that way", which wasn't true. After Jim Cramer asked "Should there be any sort of quick regulatory relief from the SEC that would make life easier to be able to make your bank much stronger? ", Mr. Steel lied when he responded "I don't think it's about my bank", which wasn't true, as the SEC and FED allowed violations of SARBOX reporting requirements by both Wells Fargo and Wachovia among others for Steel to have been able to make the statement without being charged for insider trading and securities fraud. 21. 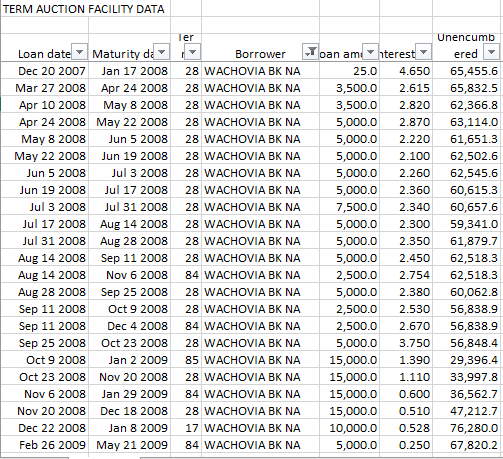 On 9/25/2008, when Wachovia borrowed an undisclosed $5 billion from the FED's TAF, Wachovia’s unreported credit line was $56.8 billion. 22. Wachovia Corporation's form 10-Q for the quarterly period ended September 30, 2008 pursuant to 18 U.S.C. Section 1350 as adopted pursuant to section 906 of the Sarbanes-Oxley Act of 2002 certified by Robert Steel, did not disclose the type, terms, interest charges, dates, collateral, values or amounts of financial assistance provided by the FED and other material terms. The SEC filing misled shareholders and violated securities laws when it stated "I, Robert K. Steel, certify that: I have reviewed this Quarterly Report on Form 10-Q for the quarter ended September 30, 2008 of Wachovia Corporation; Based on my knowledge, this report does not contain any untrue statement of a material fact or omit to state a material fact necessary to make the statements made, in light of the circumstances under which such statements were made, not misleading with respect to the period covered by this report." 23. An October 3, 2008 "Statement from Wells Fargo and Wachovia" states "Wells Fargo & Company (NYSE:WFC) and Wachovia Corporation (NYSE:WB) said today they have signed a definitive agreement for the merger of the two companies including all of Wachovia's banking operations in a whole company transaction requiring no financial assistance from the Federal Deposit Insurance Corporation (FDIC) or any other government agency", which wasn’t true. 24. The FED unanimously approved Wachovia's merger with Wells Fargo on October 12, 2008 as Wachovia's FED TAF and Discount Window borrowings were a material 449.72% of Wachovia’s market capitalization. 25. Federal employees at the FED, SEC and FDIC must have known Wachovia and Wells Fargo CEO's Robert Steel and John Stumpf did not disclose FED TAF and Discount Window borrowings in merger related SEC filings and Wells Fargo’s 2008 annual report, after the merger. 26. Wachovia’s market capitalization lost about $42.672 billion between the first undisclosed TAF loan borrowing with a $65.4 billion credit line and the Wells Fargo merger. 27. On November 17, 2008, Robinson Bradshaw's Robert Fuller filed a BRIEF OF DEFENDANT WACHOVIA CORPORATION AND OF INDIVIDUAL DEFENDANTS OPPOSING PRELIMINARY INJUNCTION in defense of the Wells Fargo Wachovia merger which stated; "In the three-week period prior to October 3, Wachovia experienced an acute liquidity crisis that, ...placed Wachovia on the brink of receivership" without disclosing Wachovia's available FED borrowings and credit lines. And "Without the Wells merger, Wachovia either had to pursue a sale of assets ... or go into FDIC receivership and suffer a complete and certain loss of its shareholders' equity." without disclosing Wachovia's available FED credit lines. And "financial market participants, depositors, and other counterparties had begun refusing to deal with Wachovia" after Wachovia's Robert Steel didn't disclose the firm's available FED credit lines. And "The merger agreement had the desired effect of providing assurance to third parties that allowed Wachovia to obtain access to capital and recover stability" after Wachovia's Robert Steel and Wells Fargo’s John Stumpf failed to disclose Wachovia’s or Wells Fargo’s FED borrowing or available access to capital via FED credit lines. And "Despite diligent, persistent, and continuous efforts after the board meeting on September 16 to raise capital, sell assets ... Wachovia had been unable to reach any definitive agreement with a third party that would allow Wachovia to resolve its liquidity issues and avoid FDIC receivership" while Wachovia was in possession of an undisclosed FED credit line totaling $56.838 billion, which Robert Steel was aware of and John Stumpf should have been. 28. On December 31, 2008, Wachovia had no borrowings from the Fed's Discount Window, and $40 billion in borrowings from the TAF, while Wells Fargo borrowed $32.5 billion from the TAF, totaling a material $72.5 billion borrowed on the eve of a merger transaction executives from both companies said no government agencies were involved in, which wasn't true. 29. Wells Fargo CEO John Stumpf knew and proceeded with the merger, signing false SEC certifications in the process. 30. After the Wachovia merger, Wells Fargo's 2008 annual report certified by John Stumpf, didn’t disclose Wachovia’s Discount Window borrowing, TAF or the overall size of FED’s TAF loans and credit lines, interest rates and maturities, all of which were material inside information known to Wells Fargo CEO John Stumpf and Wachovia CEO Robert Steel, but few others. 31. An example of what Wachovia and Wells Fargo should have disclosed in Zions Bancorporation's fiscal year ended December 31, 2008 form 10-k, which states; "In December 2007, the Federal Reserve Board announced a new program, the Term Auction Facility (“TAF”), to make 28 day loans to banks in the United States and to foreign banks through foreign central banks. These loans are made using an auction process. Zions Bank is currently participating in the TAF and may continue to do so as long as money can be borrowed at an attractive rate. The amount that can be borrowed is based upon the amount of collateral that has been pledged to the Federal Reserve Bank. At December 31, 2008, $1.8 billion in borrowings were outstanding under this program as compared to $450 million at December 31, 2007. However, by February 13, 2009, the TAF borrowings outstanding had been reduced to $500 million. At December 31, 2008, the amount available for additional Federal Reserve borrowings was approximately $4.3 billion, which had increased to $5.7 billion by February 13, 2009. An additional $1.3 billion could be borrowed at December 31, 2008 upon the pledging of additional available collateral. At December 31, 2008, the Company’s subsidiary banks had a total of $13.1 billion of immediately available, unused borrowing capacity at the Fed and various FHLBs, which had increased to $14.3 billion as of February 13, 2009." 32. On February 17, 2016, I survived a motion to dismiss in a federal court as a pro se litigant which implicates John Stumpf and other Wells Fargo executives with false SEC certifications, securities fraud and insider trading during the financial crisis. “…Defendant also alleges that the SEC at some point inquired about these SEC filings, citing to a letter between Wells Fargo and the SEC. (Id. ¶ 21.) Finally, Plaintiff alleges both that the Securities Division of the North Carolina Department of the Secretary of State found enough merit to his concerns on this issue to refer them to FINRA and the SEC, and former SEC officials who were interviewed about the issue found plausible violations among his concerns. ...Plaintiff has alleged enough to show the objective reasonableness of his concerns. If financial experts and the SEC itself were concerned about the materiality of these non-disclosures and possible violations of the securities laws, it is contrary to reason to find it unreasonable for Plaintiff to have believed they were violations as well. As such, the court finds that Plaintiff has alleged that he had an objectively reasonable belief that these actions constituted a violation of the law..."
33. After paying former Goldman Sachs colleague Peter Weinberg's Perella Weinberg Partners $25 million and Robert Steels' former employer Goldman Sachs $25 million to advise Wachovia on the merger with Wells Fargo, Steel became CEO of Perella Weinberg Partners in 2014. Getting closer; "Wells Fargo sales scandal extends to brokerage unit: US senators"
NPR's Chris Arnold; "Former Wells Fargo Employees Join Class Action Lawsuit"
Awesome; "Former Federal Investigator Says Government Didn't Investigate Wells Fargo Whistleblower Cases"
"Wells Fargo Whistleblower Claims Get New Scrutiny in Labor Review"
From the comments; "Wells Fargo CEO John Stumpf has got to resign now"
Dear Andrew Brod and friends who know who they are; "Wells Fargo's community banking exec reportedly leaving with $124.6 million"